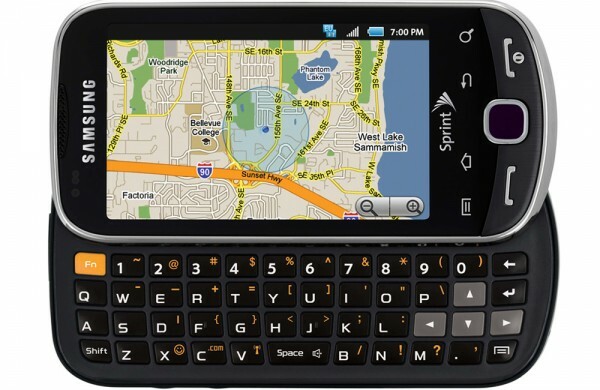 Today Samsung and Sprint introduced a new Android smart phone, the Samsung Intercept. While many devices begin to move towards being entirely touch interface form factor, the Samsung Intercept comes with a full slide out QWERTY keyboard in addition to a 3.2 inch touchscreen. The phone comes pre-loaded with a bunch of social apps as well as the ability to post content to a variety of social networking sites with a single touch. Although Sprint has released a few 4G phones in the past month, the more-affordable Samsung Intercept still runs on the carrier’s 3G. Sprint will begin selling the Samsung Intercept starting July 11 for $99. As Sprint and Samsung are attempting to make smart phones more widely accessible, the $99 price point (after $100 mail-in rebate) makes the Intercept a great choice for customers. However, the Intercept requires Sprint’s Everything Data plan, which starts at $69.99. The Intercept comes bundled with many Google services such as Search, Maps, Gmail, YouTube, the Android Market, and more. Unfortunately, it comes loaded with Android 2.1, but I wouldn’t be surprised to hear about an Android 2.2 update in the near future. The Samsung Intercept seems like a decent mid-range/low-end smartphone, with a smaller screen size and relatively low resolution camera being two real drawbacks. The phone is actually better for frequent texters due to the slide out QWERTY keyboard as well. But with great, high profile phones like the HTC EVO 4G selling for only $100 more, the Samsung Intercept will be facing some tough competition. Even the Samsung Epic 4G might be a more worthy option.